VLC Media Player, known as a simple, fast and powerful free media player, is claimed to play almost all video and audio files, Files, Discs (DVD), Webcams, Devices and Streams. While it’s not hard to find that VLC does not support Blu-ray Disc as source media. Though you have successfully ripped Blu-ray Disc to VLC friendly format you may not play the ripped Blu-ray movies by chapters. Which ripper or converter can completely rip Blu-ray Disc to VLC Media Player acceptable format and preserve original chapter info at the same time? The answer from my side would be Pavtube ByteCopy, a powerful BD\DVD lossless backup and ripping program, can perfectly preserve multiple audio streams and subtitle tracks as well as chapter markers from original Blu-ray and DVD Disc. Connect BD driver with your computer using USB cable, insert disc, then launch Pavtube ByteCopy to load your Blu-ray Disc by clicking “Load Disc” button. Latest ByteCopy application includes all functions in Blu-ray Ripper and previous ByteCopy, in other words, you could lossless backup Blu-ray\DVD Disc to MKV with original chapter structure preserved; meanwhile you could rip BD\DVD Disc to other video format for mobile devices. For your purpose, choose “Multi-track Video” > “Lossless/encoded Multi-track MKV (*.mkv)” to backup Blu-ray Disc with original chapter info saved. 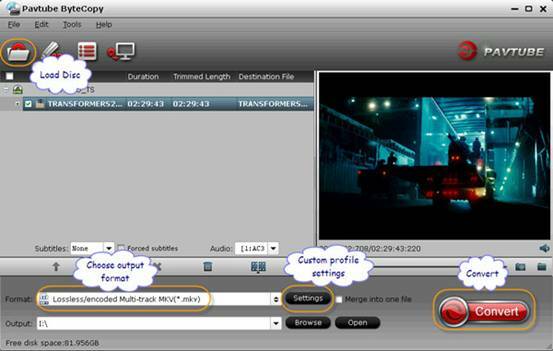 Tip 1: By default settings in profile “Lossless/encoded Multi-track MKV (*.mkv)” you would get a lossless backup of Blu-ray movie, with all subtitles and audio streams as well as original chapter markers. Tip 2: If you want to remove unwanted audio or subtitle stream from original BD\DVD for output, just unselect the box in front of it. Tip 4. The trial of Pavtube ByteCopy works 6 times only for Multi-track output. You need to purchase the software ($42) for further use. Click the “Convert” button to start Blu-ray to MKV conversion. 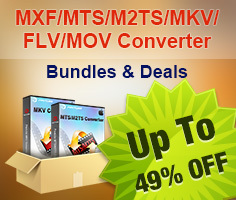 Once conversion completes, click to get generated MKV file. The ripped MKV file can be played in VLC Media Player without a hitch. Below shows how to select specific chapter as starting point when playing ripped Blu-ray/DVD movie in VLC Media Player. Step 1. Run VLC Media Player, follow “Media” menu>> “Open File…” to browse and play ripped Blu-ray movie in VLC Media Player. Or just click the ripped Blu-ray movie and open in VLC. Step 2. From the Playback drop-down list, click “Chapter” to select any chapter you want to start playing ripped Blu-ray movie in VLC Media Player. 1. Pavtube ByteCopy supports Directly Copy feature so that you could save 100% intact .M2TS main movie from original BD disc, with all subtitles and audio tracks preservation and leave out extracts. 2. New ByteCopy now supports saving encoded multiple audio tracks in other two formats: .MP4 and .MOV besides .MKV under “Multi-track Video” for audio selection. 3. Pavtube ByteCopy, same as Blu-ray Ripper, now supports video editing options, including trimming, cropping, adding watermarks, splitting and merging into one file.